Content marketing and link building have become increasingly difficult. Not only is there huge competition in nearly every industry but the Google algorithm is continually raising the bar. Now people overwhelmingly accept that it’s not about the quantity of content – it’s about quality and how authoritative and influential each piece of content can be. So what if you could consistently create quality content that editors love, that readers enjoy, and that bring real benefits to clients you feature? 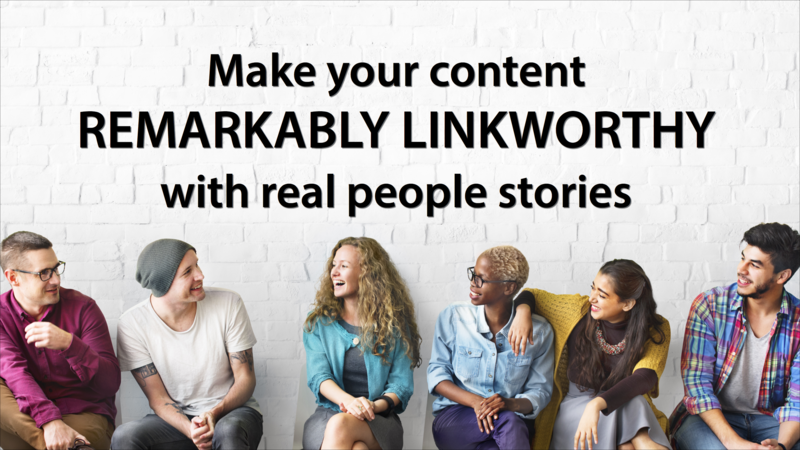 The secret is telling real people’s stories and in this article I’m going to give you some examples plus 7 reasons why every content marketer, SEO and link builder should be learning the story approach to content creation. But first let me briefly tell you how I got here. Free mini-course on The Story Approach (Just follow this link to get free access: http://www.thestoryapproach.com/free-course). “The first run of 2000 copies of the book have flown out and we’d like to reprint another 10,000 right away!” That’s the call I got from the director of a UK enterprise development agency who’d commissioned me to write a book promoting a marketing education program. A nice call to get from a client and I’m sure the success of the book was down to one thing – I used real people’s stories to great effect. I didn’t want to write the sort of worthy content they’d been producing in the past – I wanted something to reflect the excitement of successfully marketing your business. I came up with the concept of ‘Marketing Makes The Difference’, a book made up almost entirely of interviews with businesses who had already graduated from the education program. I simply told the stories of how what they’d learned had made a tangible difference to each of their businesses. I interviewed over 20 entrepreneurs over a four-week period – and also talked to customers and staff to get as full a picture as possible. I then choose the best 10 and edited the interviews into a series of compelling marketing lessons. The secret to the book’s success was featuring real people in the content I created. So rather than make myself central, I explained marketing through the experiences of real people who have used it to great effect – and in different ways – in their own businesses. I kept my commentary to a minimum and let people speak for themselves. My main task was not writing, but editing the experiences and thoughts people shared with me in the interviews I’d conducted. To make the story approach work for content marketing requires 3 things: first, to find appropriate people to interview; second, ask questions and probe so that people reveal their experiences; and third, turn their answers into coherent and compelling content. That book project was way back in the 1990s and I have included the story approach in my work ever since. It is an approach that can be adapted to content marketing, SEO and link building with powerful results. to turn their answers into compelling content. Journalists have been using this approach for years and they can provide inspiration and methodologies for content marketers to follow. Using quotes produces copy that is instantly alive and compelling – and even better, it makes copy easy to write. And how often have you been stuck on how to start an article? write an introduction to an article and struggled to set up the scene effectively. Quotes also give the struggling writer great material with which to construct their piece, “writers can animate an ordinary quote with description, movement, colour which act like stage directions”. Writers can use quotes to plan and structure their articles – to such an extent that the content almost writes itself. There’s no better place to look for great examples than news websites known for their quality writing. I spend at least an hour every day looking at media sites every day to collect great examples and inspiration – and you can do the same! Let’s look at some examples from newspapers over the last few days. 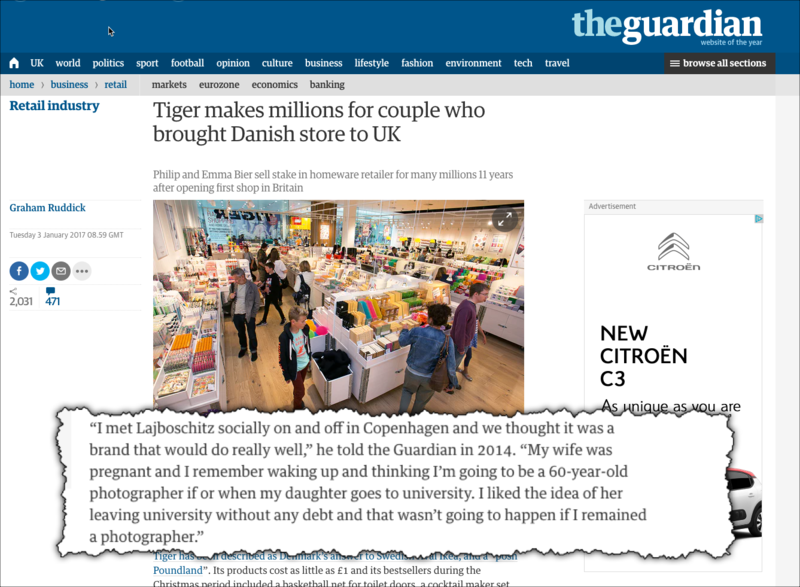 This article in The Guardian covers the sale of ‘Tiger’, a Danish retail chain in the UK – but it’s not told from the point of view of the new owners as you might expect. Rather, the article concentrates on the personal story of the husband and wife team who brought the store to the UK in the first place – Philip and Emma Bier . It’s a very personal story. Philip Bier recalls his thoughts on why he got into the business in the first place – he was thinking that he was “going to be a 60-year-old photographer if or when my daughter goes to university. I liked the idea of her leaving university without any debt and that wasn’t going to happen if I remained a photographer”. It is this story that catches the attention of the journalist, wins the approval of the editor and provides an inspiring story for the readers. And the free publicity is just as valuable to the new owners because it shows the retail chain in such a positive light. And a perfect example of this in action appears in this New York Times article. Here the opening kicker, “If you are reading this at 3 AM, chances are that James Pride wants to put you in a deep slumber”, very much sets the scene and gives a vivid picture of what the story is going to be about. I love this opening because it speaks directly to the reader and promises an answer to the problem at the earliest opportunity. The article then goes on to explain that Mr Pride is a British citizen who got an award of $100,000 for skipping college! A great entrepreneurial story. In all, the article mentions and gives editorial links to five people who have knowledge and strong opinions on sleep problems and the solutions that are available – technical or otherwise. These people give expert insight that the journalist just doesn’t have – and furthermore, it’s a classic example of how quotes can be used to structure an article. It’s not just a ‘5 experts give their top tips’ type of article. The journalist goes to the trouble of weaving their quotes into a satisfying narrative – a piece that the reader is likely to enjoy reading from start to finish. The journalist goes to the trouble of weaving their quotes into a satisfying narrative – a piece that the reader is likely to enjoy reading from start to finish. This is an excellent example to emulate – can you collect ideas from other people to include in your own comprehensive content? This is a seasonal story with a controversial twist – what should you do with Christmas gifts that you just don’t want? 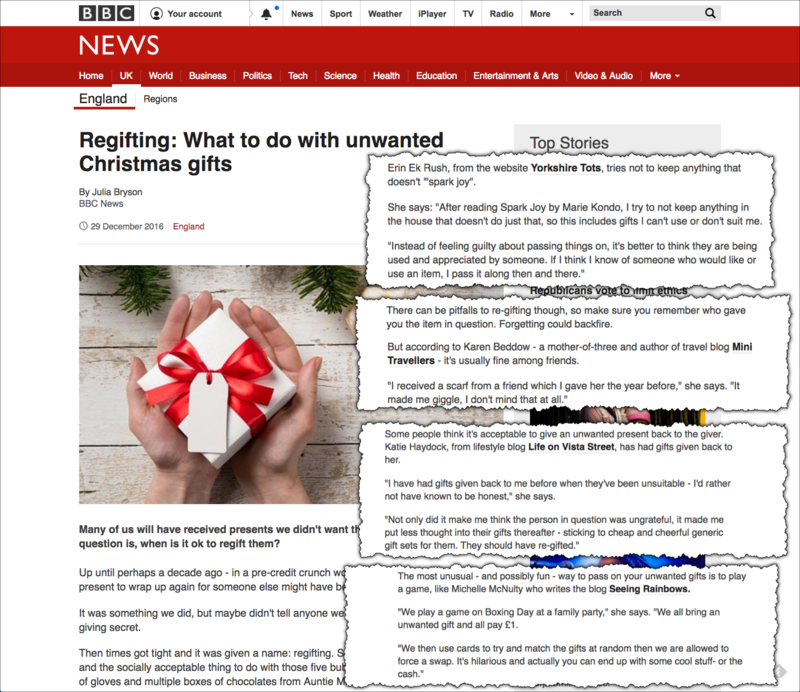 The answer is regifting says this article from the BBC – in other words passing the gift along to someone else – another friend or family member. In writing the article, the journalist seeks out the opinions of 7 bloggers and asks them what they think of regifting and whether they have any advice on those considering it. This is a classic type of story that journalist might post on sites such as HelpAReporter.com – where reporters post questions and ask the many thousands of subscribers to respond. They receive multiple replies, perhaps 20, 40, 60 or even more – and then use the best to construct their story. This gives journalists a fruitful and easy way to access multiple opinions in a short period of time. As in the first example from the New York Times, the complete article can be structured through the quotes that are used. This adds a ‘real people’ perspective to the old-school type of article that content marketers and link builders have used in the past – something like ‘7 ways to safely regift unwanted presents’, or other formulaic content. Probably a link builder might do a Google search to find similar stories and then tweak the content to come up with a ‘new’ list of 7 ways. But by seeking out and asking people’s opinions and experiences, then the content will be truly unique – and the writer has the chance to be surprised themselves. That’s the great thing about collecting ‘people’ stories – you never know where they’re going to take you! For the reader, and the editor publishing the piece, the quotes from real people add an extra dimension. However, by reaching out to a number of relevant bloggers, the link builder can get a lot of content, varied opinion and even controversial thoughts or examples. The people element really lifts the piece. Of course, if you’ve done any interviewing, you know that the biggest part of the task is editing the huge amount of material you can gather from interviews. When I did my 4 weeks of interviewing for ‘marketing Makes The Difference’, I couldn’t possibly have used all the material I collected. The important task I had to do was go through all that material, pick out the really interesting stuff and then polish it into the final text that would be used in the book. But editing people’s quotes is fine – as long as you preserve the interviewee’s real meaning. In what I think is one of the best books I’ve ever read on writing, “Stein on Writing”, he says, “in reporting spoken words, it is not the writer’s obligation to reproduce all of the words as long as the speaker’s meaning is preserved”. Stories provide the type of content Google increasingly likes. Gary Illyes of Google (largely taken over Matt Cutts role) said at Milan SMXL that Google preferred the natural language used in conversation over ‘ordinary text’! – this was news to me – but I was in the audience :-). Stories create content that is truly unique. No-one else was there, just you and the interviewee – so no-one will have the exact same insight you gained from the interview. Stories are deeply meaningful to the people telling them. Everyone has stories to share, but they’re rarely asked to tell them. But when you do ask – and really listen – something magical happens! People just share, share, share without a fear of giving a “wrong” answer. Publishers love story-based content because they know they will resonate with their audiences, and provides compelling dialog that they’re just not getting from other people who pitch. The language people use in telling their stories is naturally vivid. There’s rarely a slow build up or academic argument to wade through – quotes get into raw feelings immediately – and there’s little chance of misunderstanding.